With the explosion of Twitter mobile apps, web-based clients, and desktop applications, it was only a matter of time before someone launched an actual Twitter-focused app store. Oneforty has built a marketplace to for basically all things Twitter, helping developers get their creations found and letting users access a centralized place to find and buy Twitter-based technologies. We have 100 invites to try out the site (OneForty is in private beta); just click here and use the code: TC140. The site lists 1,332 free and paid applications and services built on Twitter’s API, where people can search for, rate and buy Twitter services. The site also features lists of the most popular apps on the marketplace, ad lists the “best” app for nine types of Twitter services, such as apps for business, url shortners, image sharing, news, and travel. The site also hopes to be somewhat of a social network, with users having the ability to create profiles of their favorite Twitter apps and services. You sign into oneforty with your Twitter account, which lets you interact with the site with your Twitter handle. Each listing for an app or service has a detailed description of its features and and includes screenshots, and categories that the app fits into (i.e. business or mobile). You can click the “I use this” to add the app to your profile and you will be listed on the app’s page as a user. The listing also identifies the developer who created the app, features press mentions of the site or app or site and pulls in a stream of Tweets that mentions the app or site. And you can “share” a particular app via Twitter. Oneforty’s revenue model is fairly basic. 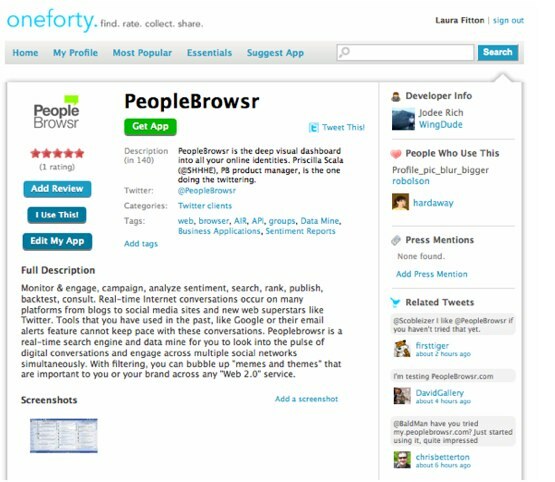 If you want to download Tweetie’s iPhone app, oneforty provides an link directly to Apple’s App Store, allowing oneforty to collect an affiliate fee. Of course for the free downloads and sites, such as TwitPic or TweetDeck, oneforty will just direct you to their sites, where you can download or access the application. oneforty is also going to list Twitter-related books and merchandise, with affiliate links to Amazon.co. An interesting bit of trivia—the site’s founder, Laura Filton, wrote the “Twitter for Dummies” book and taught a “”Twitter for Business” class at Harvard Business School. Oneforty was incubated at TechStars and is advised by Guy Kawasaki and Brian Solis. Twitter currently lists applications and also has a wiki-based directory of Twitter-related sites and apps, but it’s layout isn’t easy to navigate. Twitdom also has an application database which includes reviews and ratings but doesn’t seem to have the user interface and marketplace feel of oneforty. Finton tells me that soon oneforty will become a full fledged e-commerce platform, where developers can sell their apps on the site itself. I think its fairly easy to use and am a fan of its sharing features. 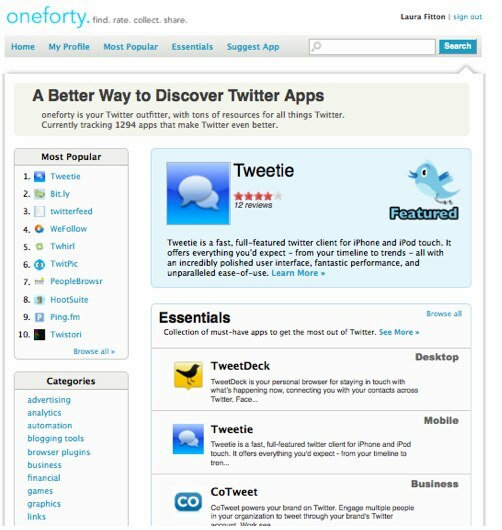 If oneforty can pick up a dedicated base of users, it has a chance at becoming the defacto Twitter app store.